For a very long time, I thought I had come up with the greatest pie dough recipe I’d ever had the pleasure of working with, and subsequently eating. It was flaky, it behaved well, and the end product was always a delight. My pie dough recipe had a squeeze of lemon juice in it, which aided the goal of keeping the gluten in the flour undeveloped and, as an end result, the dough never turned out tough. My only complaint, small as it was, was that the dough never really developed the dozens of flaky layers that I always wanted to see in my pie dough. Sure, there were layers of crisp flakiness, but not innumerable layers (like I said, small complaint). Last Thanksgiving, I decided to try out a different pie dough. Turning to my bible of all things pastry, I settled on using Tartine’s flaky tart dough, an unsweetened, highly buttery dough that I already knew I absolutely loved in savory applications. Now, here comes the part where I instruct you all to recite with me the discovery I made about this dough when used in a pie, because, by now, you all know what I am going to say when it comes to Tartine and the food it produces: This, my friends, is the greatest pie dough in all the land. So buttery, so simple to work with, and so unbelievably flaky, this is the very pie dough I have been looking for my entire life. The best part is, there is no secret to the dough. There are four ingredients, there is a standard mixing method, and then there is a nice long resting period in both the refrigerator and the freezer. If I were to really take a stab at what I think makes this dough so fantastic, I’d have to go with three possible suspects. First of all, the proportion of butter to flour is marginally larger than my former favorite recipe, and it is absolutely perfect. Second, giving the dough a long resting period in the refrigerator before rolling it out and forming it seems to add a particularly fine texture to the dough, as you are allowing the butter, water, and flour to adhere to one another better without coaxing them along with your hands or a food processor and working the flour’s gluten too long, thus making the dough tough. A well-chilled dough also allows the small, pea-sized chunks of butter to firm up slightly, which makes the flour and water form tiny little pockets around the butter pieces, which results in a super tender and flaky crust when baked. I rested this pie dough in the refrigerator overnight and it was simply dreamy. Third: no sugar. No sugar. So simple, right? For some reason I always thought that I had to add a tiny shot of sugar to my sweet pie and tart dough, but, now that I think of it, that makes absolutely no sense. If you pie’s filling is going to be sweetened, why gild the lily and sweeten up your dough as well? The lack of sugar in this dough allows the flavor of the butter to really shine in a glorious and uncomplicated way, which bodes well for the dough’s richly sweet filling. Which brings me, finally, to the rest of the recipe. A hybrid of a Cook’s Illustrated recipe and what I remember about the Dutch apple pie at the restaurant where I worked as a teenager (which called the pie a French apple pie, as there seems to be quite a bit of overlap concerning what people consider a French apple pie and a Dutch apple pie), the pie I ended up making is stuffed with sautéed tart apples and topped with a hearty, crumbly, pecan-crunchy lid. When baked, the crisp topping settles into the nooks and crannies left open by the baking apples, leaving no space unoccupied by tasty, cinnamon-laden glory. At the risk of making two loud proclamations in one post, dare I say that this apple pie is the best apple pie I’ve ever had? For now, yes. But only time will tell if its throne will one day be conquered. Tartine, it’s your move. Makes 2 9-inch or 10-inch tart or pie shells, enough for 2 single-crust pies or tarts, or 1 double-crust pie. 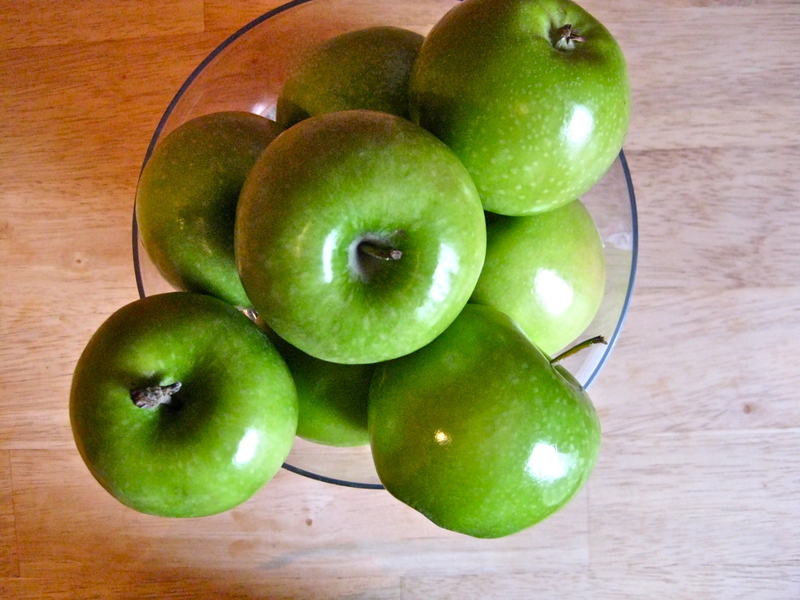 I have seen many apple pie recipes that call for a mix of tart and sweet apples, and I never understand why. Tart apples, in addition to holding their shape so much better than sweet apples, provide the best flavor balance for the sweetness of a pie’s sugar and spice. I know I tend to err on the side of less sweetened desserts these days, but, trust me, tart apples are the way to go with this recipe, or any other apple pie recipe, for that matter. On a lightly floured surface, roll out your disk of chilled pie dough into a circle about 1 ½ inches larger than your 9-inch pie dish. 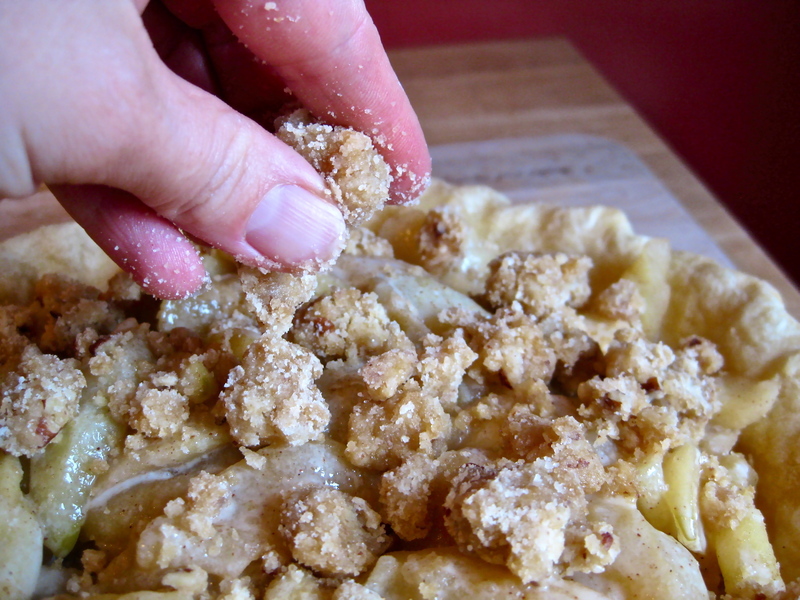 Gently transfer the dough to the pie dish, easing it into the bottom and sides, and pressing gently into place. 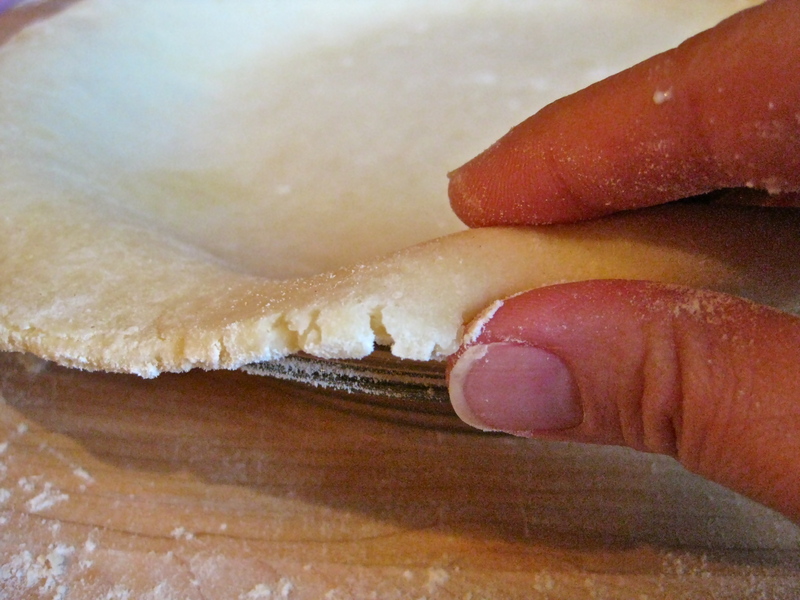 Using a sharp knife, trim the dough so it hangs over the pie dish by ½ inch, or, using your fingers, tuck the scraggly edges of the dough under itself and lightly press to adhere. Using your fingers, crimp the edges of the dough to make a fluted edges, or using the tines of a fork, press the edges of the dough to flatted it against the rim of the dish. 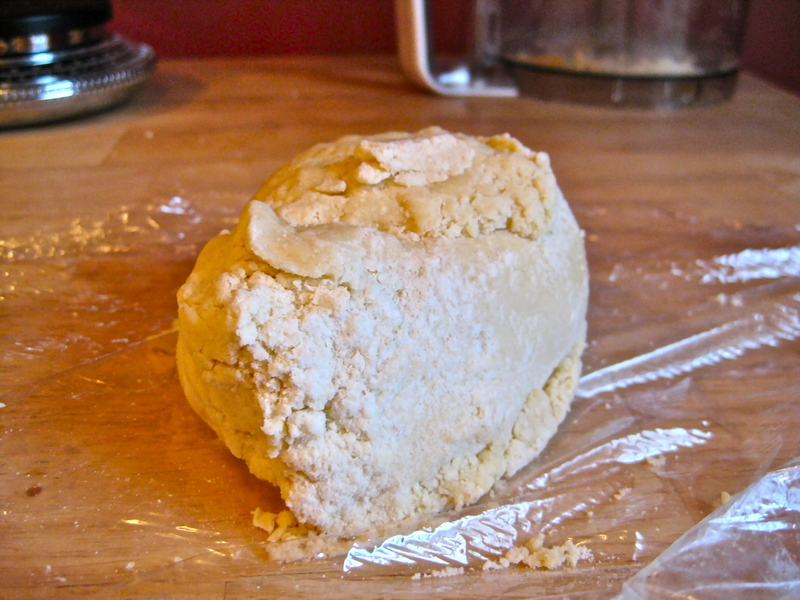 Place the formed dough in the freezer for 30 minutes to 1 hour (this ensures the flakiest dough possible). While the dough is chilling, preheat the oven to 375 degrees Fahrenheit and adjust an oven rack to the middle position. When the dough is chilled and the oven preheated, line the chilled crust with a double layer of foil and fill with pie weights. 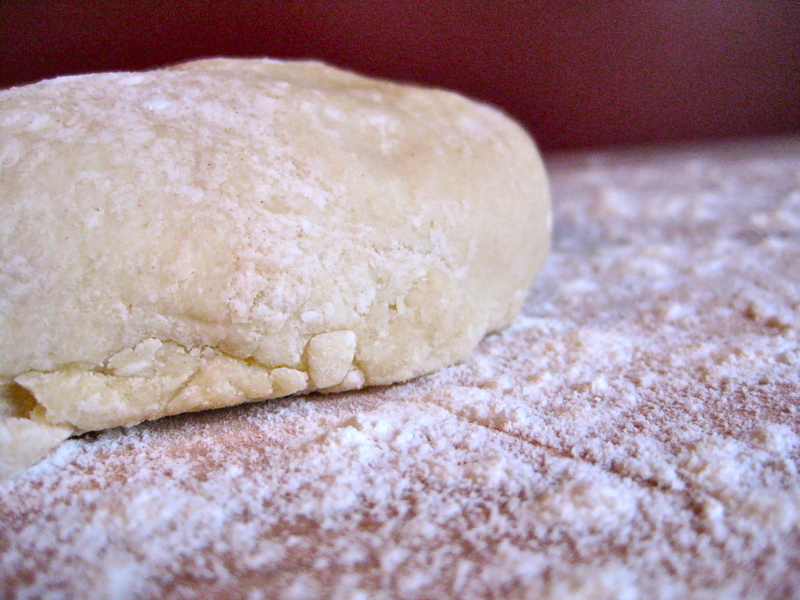 Bake until the pie dough looks dry and is light in color, 25 to 30 minutes. Transfer the pie plate to a wire rack and remove the weights and foil. With the oven still heated to 375 degrees, adjust an oven rack to the lowest position, and place a foil-lined baking sheet on the rack. In a medium bowl, mix together the flour, sugars, pecans and salt. 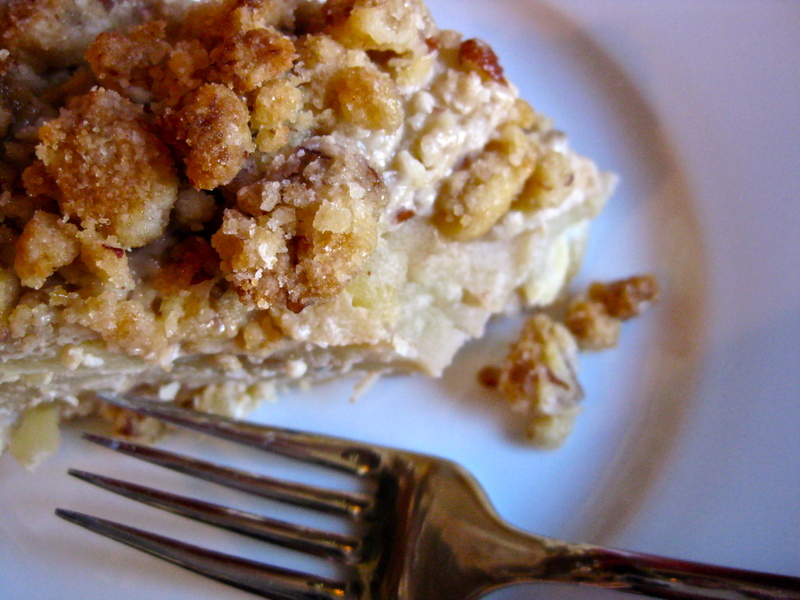 Drizzle with the melted butter, and stir the streusel with a fork until roughly combined. Set aside. Melt the butter in a large Dutch oven over medium-high heat. Stir in the apples, cinnamon, sugar, and salt. Cover and cook, stirring occasionally, for about 10 to 12 minutes, until the apples have just started to soften, and some of the apples have just begun to break down. Set a large bowl under a colander. 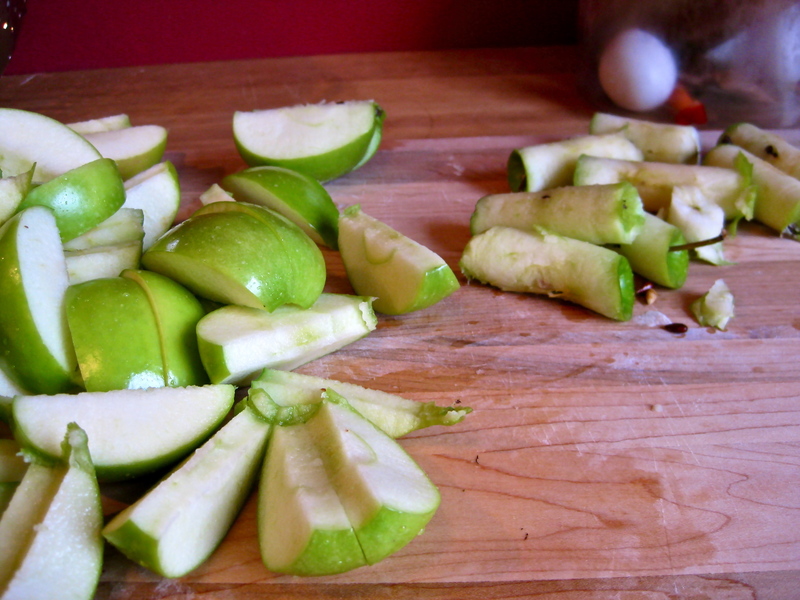 Pour the cooked apples into the colander, allowing the juice to thoroughly drain into the large bowl set underneath. In a small saucepan, combine the drained juice from the bowl with the heavy cream. Cook over medium-high heat until thick and reduced by roughly half, about 3 minutes. 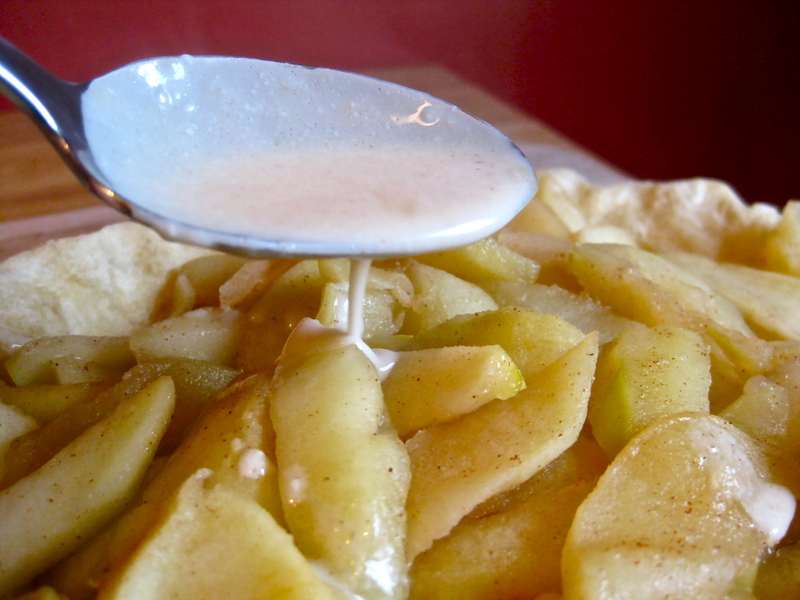 Spread the apples into the parbaked pie crust. Drizzle with the reduced cream mixture. 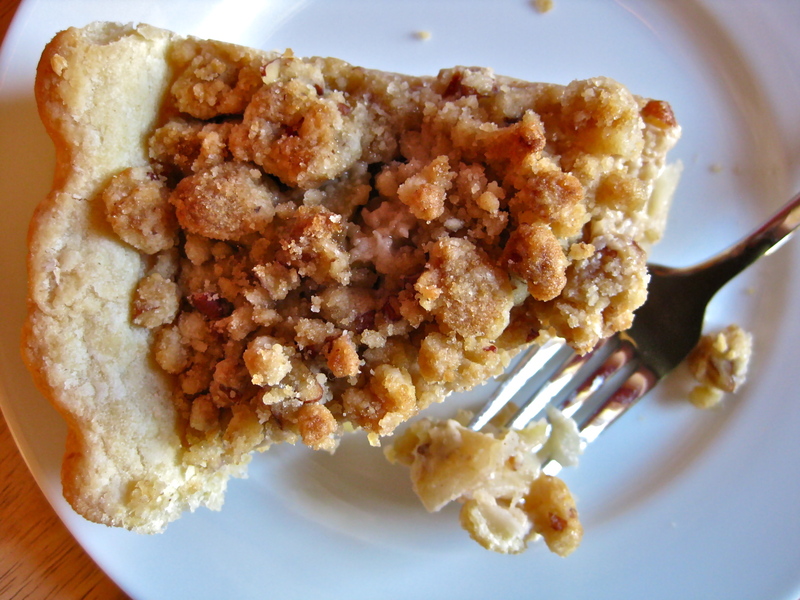 Sprinkle the streusel evenly over the top (there will be some large pieces of streusel and some small pieces—this is exactly what you want, as the variation in texture makes for a great bite). 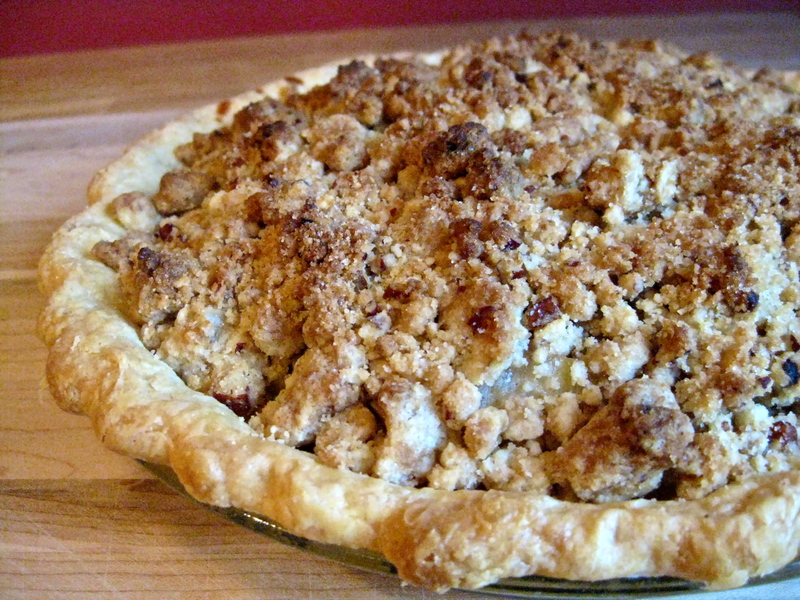 Place the pie on the heated baking sheet and bake until the crust and streusel have browned, about 25 minutes. Allow the pie to cool on a wire rack until the filling has set, about 2 hours. Definitely agree about the butter and the chilling. 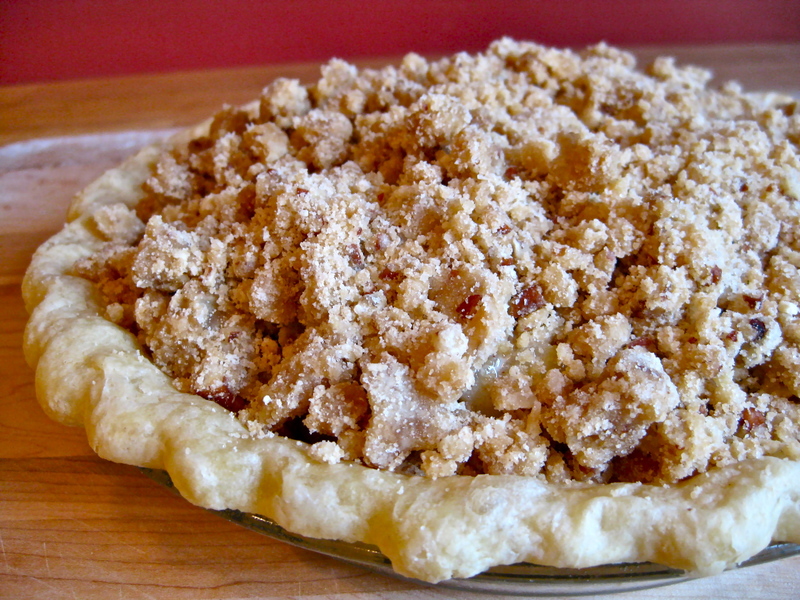 The pie crust and filling both look awesome. Made this last night! Fabulous. Kids devoured it ! Only change I made was to add an agg to the apple mixture before baking to make it firm and a little custard like. Mmmm thanks for this one. Great crust I will use time and again. I am so glad you liked the pie! It’s nice to know it was also kid-approved (always a great honor). I made this a few weeks ago and we loved it – just came back to print it out and use it for Thanksgiving as this is the best apple pie I’ve ever made – thank you! I am always thrilled to hear of someone else’s success with a recipe. I am so glad you loved it! My dough this morning is a cold hard mass. How long till I am able to roll it? 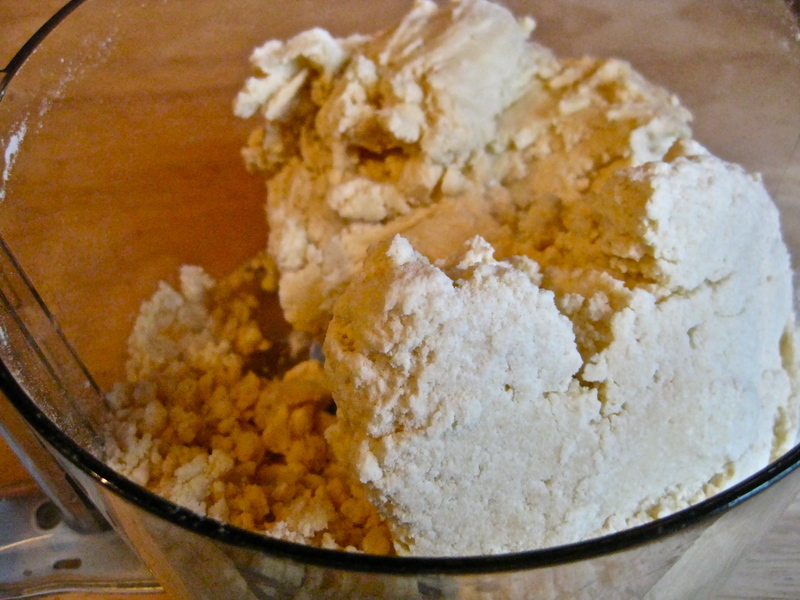 The butter in the dough will soften up as you work with it, becoming more pliable as it warms up. If you really want to speed the process along, however, a great way to quickly soften up a mass of pie dough is to lay it on a well-floured surface and just whack it with a rolling pin over and over. The more you pound on the dough, the softer it will get. Hope this helps! What is the best way to parbake this same crust for a cream pie? 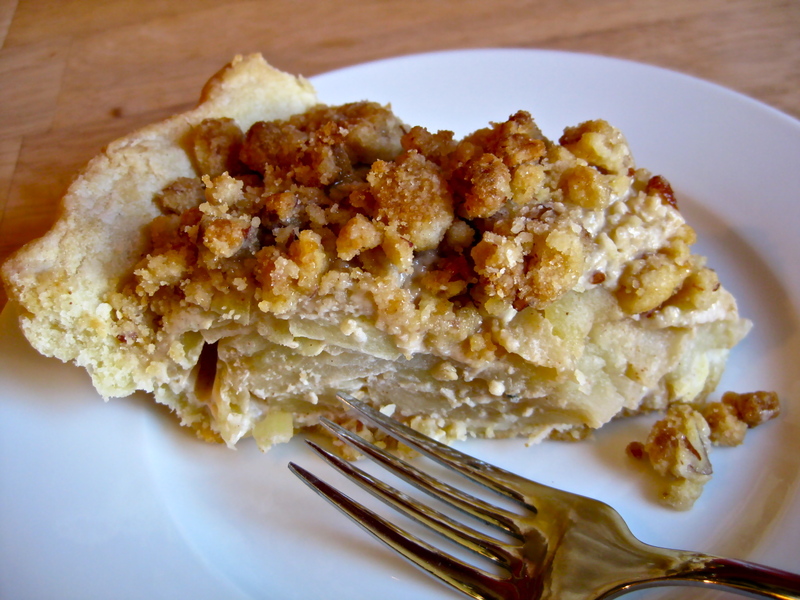 I made the Dutch Apple pie (delicious), but I wanted to use the crust for a French silk pie. I took the pie weights out about half way thru and my crust fell a little and bubbles. Should I still leave the pie weights in for the whole time? I feel like the crust won’t brown properly with the pie weights in, (I use beans for my pie weights). Thanks! Sara–I find that pie weights are totally necessary when free baking a crust for a cream pie, and you are right to take the weights out in order to finish browning the crust. I tend to split the baking time up into 2/3 with weights, 1/3 without–so I bake the crust with pie weights for 20 minutes, then without weights for 10. That will usually do the trick, though I have also, when really planning ahead, managed to have good luck with freezing my formed pie dough in its pan for about an hour before baking, then using the same method of 20 minutes with weights, 10 minutes without. Freezing the crust really sets it before baking, resulting in almost no shrinkage at all. That said, if you don’t have time to freeze the crust (which is completely understandable), try the 2/3-1/3 split on its own and let me know how it goes! Thanks for the advice! I tried freezing the 2nd crust before baking, and along with cooking it longer with the pie weights in, it turned out great! I have been using this crust recipe for my pies and it is awesome! I have one more question… how long with the crust last in the refrigerator? I am making a pie this weekend and since it makes 2 crusts I was hoping to use the 2nd one about 5 or 6 days later. Is that okay or should I use it sooner? freeze it? Thanks! I am so glad the crust is working out for you! It really is a gem of a recipe–so flaky and buttery, and it bakes like a dream. Because of the good amount of both butter and water in this dough, it does not do well in the refrigerator for more than 4-5 days. I wouldn’t really push things past 5 days, since that is the point at which the flour in the dough begins to over-hydrate and get sort of gummy. I have had good luck putting half of the dough in the freezer as soon as I make it. The dough will last for a good 2 weeks in the freezer. Thanks for sharing your success with the recipe!